Definition at line 22 of file CQLayoutScene.h. Definition at line 37 of file CQLayoutScene.cpp. References initializeResolver(), recreate(), and recreateNeeded(). Definition at line 137 of file CQLayoutScene.cpp. Definition at line 147 of file CQLayoutScene.cpp. References CCopasiVector< T >::begin(), COPASI_OBJECT_CN, CCopasiVector< T >::end(), CCopasiObject::getCN(), CLGlyphWithCurve::getCurve(), CLGeneralGlyph::getListOfSubglyphs(), CLGraphicalObject::getModelObject(), CLCurve::getNumCurveSegments(), mItems, and mpResolver. Definition at line 203 of file CQLayoutScene.cpp. References addGlyph(), CCopasiVector< T >::begin(), CCopasiVector< T >::end(), CLRenderInformationBase::getBackgroundColor(), CLayout::getListOfCompartmentGlyphs(), CLayout::getListOfGeneralGlyphs(), CLayout::getListOfMetaboliteGlyphs(), CLayout::getListOfReactionGlyphs(), CLayout::getListOfTextGlyphs(), mItems, mpRender, mpResolver, and CQRenderConverter::setBackground(). Definition at line 58 of file CQLayoutScene.cpp. Referenced by CQAnimationWindow::setScene(), CQAnimationWindow::slotAutoLayout(), CQLayoutView::slotLayoutChanged(), CQAnimationWindow::slotLayoutStateChanged(), CQAnimationWindow::slotRandomizeLayout(), and CQLayoutView::slotRenderInformationChanged(). Definition at line 63 of file CQLayoutScene.cpp. Definition at line 68 of file CQLayoutScene.cpp. Definition at line 198 of file CQLayoutScene.cpp. Referenced by CQEffectDescription::applyToScene(), and CQEffectDescription::removeFromScene(). Definition at line 132 of file CQLayoutScene.cpp. Definition at line 99 of file CQLayoutScene.cpp. References getDefaultStyle(), CListOfLayouts::getListOfGlobalRenderInformationObjects(), CCopasiDataModel::getListOfLayouts(), CLayout::getListOfLocalRenderInformationObjects(), mpLayout, mpRender, mpResolver, and CCopasiVector< T >::size(). 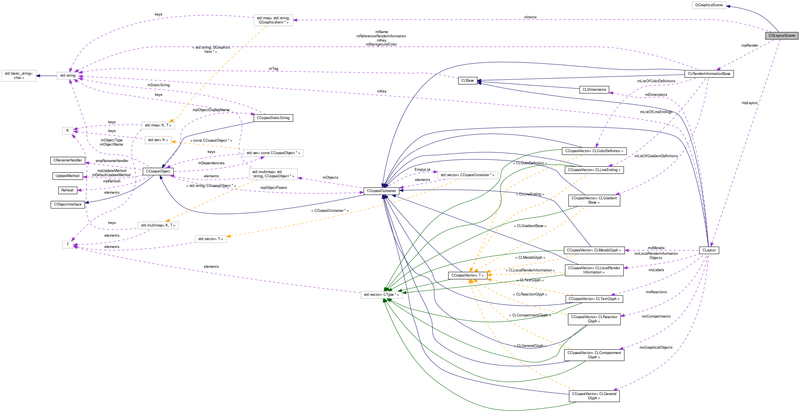 Referenced by CQLayoutScene(), and setRenderInformation(). Definition at line 141 of file CQLayoutScene.cpp. Referenced by CQLayoutScene(), Arguments::handleCommandLine(), CQAnimationWindow::setScene(), CQLayoutView::slotLayoutChanged(), CQAnimationWindow::slotLayoutStateChanged(), and CQLayoutView::slotRenderInformationChanged(). Referenced by CQLayoutScene(), and updatePosition(). const std::string & fileType = "pdf"
Definition at line 73 of file CQLayoutScene.cpp. Referenced by Arguments::handleCommandLine(), and CQLayoutView::slotSaveToFile(). Definition at line 47 of file CQLayoutScene.cpp. Definition at line 53 of file CQLayoutScene.cpp. Referenced by setLayout(), and CQLayoutView::slotRenderInformationChanged(). Definition at line 127 of file CQLayoutScene.cpp. Definition at line 335 of file CQLayoutScene.cpp. References CCopasiSpringLayout::finalizeState(), CKeyFactory::get(), CCopasiRootContainer::getKeyFactory(), moveObject(), mpLayout, and recreateNeeded(). Referenced by CQStyledGraphicsItem::mouseReleaseEvent(), and CQConnectionGraphicsItem::mouseReleaseEvent(). Definition at line 52 of file CQLayoutScene.h. Referenced by addGlyph(), fillFromLayout(), and getItemFor(). Definition at line 48 of file CQLayoutScene.h. Referenced by getCurrentLayout(), initializeResolver(), recreate(), setLayout(), and updatePosition(). Definition at line 49 of file CQLayoutScene.h. Referenced by fillFromLayout(), getCurrentRenderInfo(), and initializeResolver(). Definition at line 50 of file CQLayoutScene.h. Referenced by addGlyph(), fillFromLayout(), getResolver(), initializeResolver(), and setResolver().